It’s All About Content and It’s All Over the Top! This urge to merge seems to have become the survival business model of choice for major corporations affected by the new millennium’s evolving digital convergence revolution. Following the breakup of the AT&T monopoly under the 1982 Modification of Final Judgment (MFJ) consent decree that required AT&T to divest itself of the Bell operating companies, the competition for video, voice and data distribution rapidly expanded beyond the then traditional broadcast and telecommunications networks to include cable, satellite, fiber, cellular and other wireless media. But it was the arrival of the Internet – and the concomitant digitization of video, voice and data into what is now broadly referred to as “content” – that changed everything. The convergence of content also brought about a lot of consolidation among disparate carrier networks that distributed content. Not surprisingly, the old line telecommunications industry wheel came full circle over time as AT&T (technically, Southwestern Bell purchased parent AT&T and took its name) reacquired half of the original Bell companies and Verizon (which started off as the divested Bell Atlantic) acquired the other half, including MCI, which was the original challenger to AT&T’s monopoly. But AT&T and Verizon are no longer traditional telecom companies as they operate cellular and either fiber (Verizon FiOS) or satellite (AT&T DIRECTV) networks as well. But it’s the production of content, not its distribution that is animating the current merger discussions. It was in this defensive fashion, through Hulu, that the biggest content producers got into the disruptive OTT distribution business and their traditional content distributor counterparts, i.e., cable, fiber, satellite and cellular, started supporting OTT applications and services over their respective networks. But then these new relationships turned murky when OTT distribution pioneers, Amazon and Netflix, began producing their own content as well. 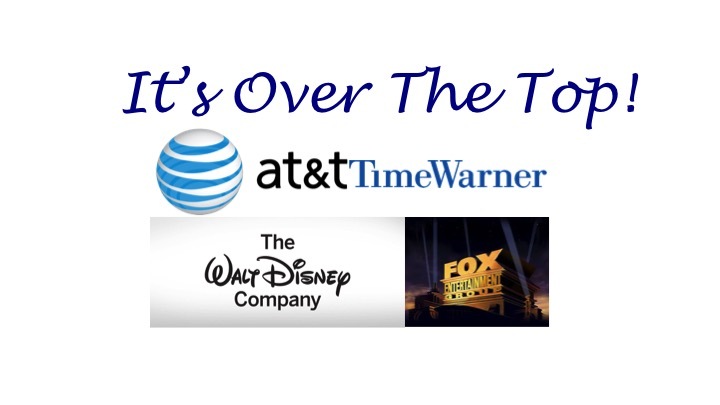 It is in this context that the AT&T-Time Warner and the Disney-Fox merger propositions have to be viewed. AT&T has a widespread content distribution network that encompasses terrestrial, cellular and satellite components. However, it is severely lacking on the content production side and is looking to obtain this capability through its acquisition of Time Warner. Meanwhile Disney recognizes the threat posed by OTT distribution pioneers, Amazon and Netflix, who are rapidly expanding their own content production efforts. And hence, Disney’s reported discussions with Fox seeking to acquire Fox’s entertainment related businesses with the intention of quickly scaling its own content empire. Thus suggesting that while content is king, content acquisition is the real ace of spades in the age of OTT. So while traditional content producers have reconciled to the reality of OTT distribution, they are still coming to grips with the challenge of competing content production by OTT distribution pioneers, Amazon and Netflix. It’s rather ironic that this competing “over the top” content seemed to have knocked Hollywood off its game! But as Amazon and Netflix content wins more accolades and even more eyeballs, Hollywood studios and New York’s media conglomerates have no choice but to fall in line. The question is will the Department of Justice see the “Netflix and Amazon” forest for the “Time Warner and Disney” trees and allow market forces to work their will? Fasten your seatbelts; it’s going to be a bumpy ride!